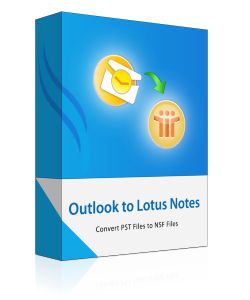 To migrate Outlook to Lotus Notes the tool facilitates in the conversion of selected folders. The user can effortlessly export requisite folders of Outlook PST by selecting the boxes provided in front of the data items. By default all folders of MS Outlook are exported by the utility. Using the tool user can easily migrate specific data from Outlook to Notes by applying filters on Email, Calendar and Task. These filters aids to export data of particular time period by filling the dates in "From" and "To" option via which the tool only export data of selected dates. With the conversion of PST file to NSF, the tool sustains the hierarchy of the folder and sub folder structure properly. In this way, the user can effortlessly access the original structure of folders and files as it obtained in the Outlook PST before conversion. To save the resultant Lotus Notes file obtained after conversion the tool offers the facility for the creation of new folder at desired location. By this one can easily store the file either by choosing from a predefined location or in new folder. DEMO version of PST to NSF Conversion tool preview all the Outlook PST items & export 15 items per folder. Is it possible to execute the software without the installation of MS Outlook on machine? No, to convert database from Outlook to Notes with the help of software it is essential to install the any edition of Microsoft Outlook before conversion. Which version of IBM Notes is supported by the software? You can use any edition of IBM Notes to open the resultant NSF file, as all versions are supported by the software. Can I export Outlook email with linked attachments to IBM Notes? Yes, using Outlook PST to Lotus Notes software you can migrate all emails with linked attachments as well as other data easily. What is the size limitation of Outlook PST file to be converted? The tool does not inflict any restriction in the conversion of PST file. Using the tool you can migrate Outlook PST file of any size. It was a wonderful experience while using Outlook PST to Lotus Notes migration tool due to its user friendly feature which can very easily convert bulk of PST file into NSF file within a nanosecond. So that was really appreciable. Thanks! This software make me enabled to migrate 25 GB of Outlook data files into Notes file within a very short duration. My hearty thanks to revove groups for introducing an unexpectedly tool for Outlook to Notes migration.